First Lt. Charles F. Gumm, Jr. looked out from his cockpit, scanned the sky and scanned again. He was called Chuck. He was 22 years old and a distant relative of film star Judy Garland, whose real name was Frances Gumm. He was a gentle man, his wife Toni liked to say, unassuming and earnest. His handsome face often had a sheepish look accompanied by a boyish smile, as if he couldn’t quite believe he was enjoying life so much. He made always made an impression: his flying buddies consistently remembered him as “tall” when, in fact, he was not. Now, Gumm was a P-51B Mustang fighter pilot escorting American bombers to Bremen on Dec. 16, 1943. With the Merlin engine of his sleek fighter turning over smoothly in front of him, Gumm peered upward toward a mercilessly bright sun in a region where the weather was usually gray and wet. He squinted. They were only small blemishes at first, but they were getting larger. He was looking at four Messerschmitt Bf 109 fighters jockeying into position to attack a box of bombers. “Looks like we’ll have to climb into them,” said the voice in Gumm’s earphones. That was 1st Lt. “Deacon” Talbot, whose olive-drab P-51B was glinting in the sun off Gumm’s wing. The two men could look at each other but not see facial expressions because of their helmets and oxygen masks. Gumm flicked a switch to arm his plane’s four 50-caliber M2 machine guns and knew Talbot was doing the same. 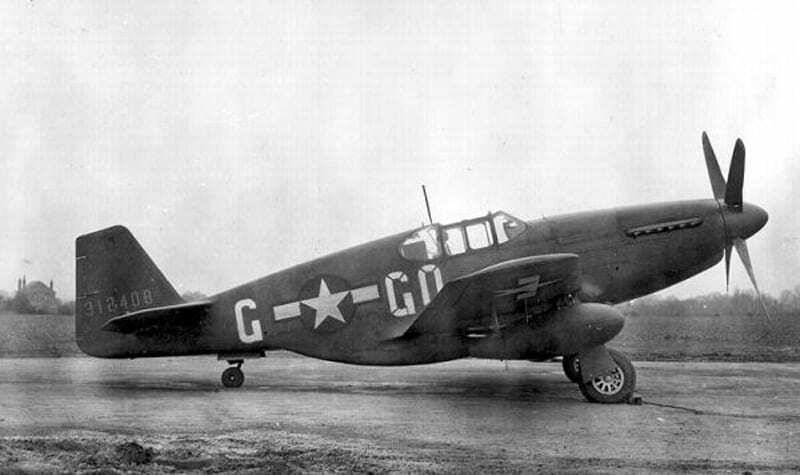 P-51B-1-NA Mustang (43-12408) of the 355th Fighter Squadron, 354th Fighter Group, RAF Boxted, England, early in the type’s career in the air war over Germany, when P-51s still wore olive drab over gray warpaint, and the only squadron markings are the codes on the fuselage sides. National Archives via the United States Air Force Historical Research Agency, Maxwell AFB Alabama. The Messerschmitts were lining up to attack the B-17 Flying Fortress heavy bombers from behind, a hint that the Luftwaffe pilots might not be skilled enough for a frontal attack from a few degrees above the centerline – the position the Americans called “twelve o’clock, high,” from which position experienced German fighter pilots did their very best to kill the American bomber pilots. “Talbot and I climbed after them, and when within 400 yards range two of the enemy aircraft saw us and broke left and straight down,” Gumm later said in a report. “We closed on the other two and I dropped back a little to cover Lt. Talbot’s tail, but the enemy saw him and broke left and down. It was the first time an American pilot in a P-51 Mustang had shot down a German aircraft. “I remember in Don Blakeslee’s first briefing before he led our first combat mission he said, ‘Whoever breaks first in a head-on pass situation is at a disadvantage. We don’t break first. Make the other guy do that.’ We wondered at the time what happens when the ‘other guy’ gets the same lecture? Martin agreed – ‘that’s the way we’ll do it!’” Months later, his own advice made Martin a prisoner of war. Gumm and Gross belonged to the group’s 355th squadron, the “Bulldogs” alias the “Pugnacious Pups,” commanded by Maj. George R. Bickell, a veteran who’d flown at Midway in the Pacific after the great battle there. They were part of VIII Fighter Command, a component of the Eighth Air Force – the growing military formation that would eventually inhabit no fewer than 122 airfields in along the eastern rim of the British Isles known as East Anglia. On Jan. 6, 1944, Lt. Gen. James H. Doolittle, the new Eighth Air Force commander, ordered his fighter boss, Maj. Gen. William Kepner, to turn these young men loose. “Your priority is to take the offensive,” Doolittle told Kepner. Eventually, men in Mustangs won a decisive victory over the experienced, disciplined, brave men in German cockpits. It happened because of the P-51 Mustang, but the P-51 wasn’t always the choice of the Army Air Forces (AAF).